This is an important study of the household affairs of the Willoughby family of Wollaton Hall in Nottingham and Middleton Hall in Warwickshire. Made wealthy by inheritance and coal mining, they built a wonder-house at Wollaton, designed by the architect Robert Smythson. The survival of their archive allows close analysis of their domestic arrangements. This goes far towards answering questions we all like to ask about the food of our ancestors: Where did they buy it? How much did they eat? When did they eat it? What arrangements for cookery and dining were in place in their houses? 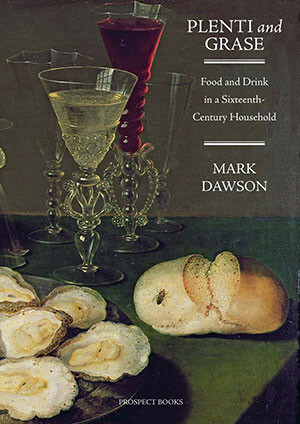 Mark Dawson has been able to construct a valuable account of the place of food in the running of a large household as well as to offer convincing quantities and figures as firm foundation to his commentary. He identifies many interesting developments in the Tudor kitchen and dining-chamber: the shift from mild ale to bitter beer; the move away from the heavy and elaborate spicing of late-medieval cookery; the decline in enthusiasm for salted herring; the fluctuation in observance of Lenten and religious fasts; the embracing of new foods, not least, for example, the turkey; and the complex and thoroughgoing network of supplies and provisioning through merchants, markets and fairs. His focus is not restricted to the top table, the lords and ladies, but embraces the food of the household at large, from gentleman-ushers to scullions and dairymaids. Trying to shed some pounds for spring? Has your doctor recently told you to cut back on alcohol and red meat? Or is your spouse gently prodding you to lay off the stodge? Well, if you’re consuming less than 2lb of bread, 2lb of meat, and six pints of beer a day, then you’re doing better than our Tudor ancestors, according to Mark Dawson’s new study of the food habits of a wealthy Midlands gentry family in the 16th century. Using household accounts, Dawson tells the story of five generations of Willoughby family food from 1520 to 1604, a time when white manchet (chalk-adulterated dough) was the bread of choice and the kingdom was discovering a new taste for a hop-infused ale which they called beer. Food, like clothing, comes in and out of fashion and a longitudinal study like Dawson’s allows us to trace this. Pig meat, once cheap and commonly available, declined from favour, while rabbit eating greatly increased (enough to justify the expense of the Willoughbys having their very own ‘coninger’, one Thomas Hill, to catch them). Our perennial Christmas bird, the turkey, was an exotic novelty when it made its first entrance in the accounts in 1573. Dawson’s study confirms, unsurprisingly, that red meat was the focal point of the Tudor diet. The Willoughbys, like others, fasted from meat on Fridays and Saturdays, in Lent and on saints’ days, but feasted on flesh the rest of the year. Some of the quantities are staggering: in 1566, a reduced household ate 80 pigeons in just one fortnight. This is despite the fact that, contrary to the image of the Tudor lord throwing chicken legs over his shoulder, people mostly ate their own cows. Failing cows, they ate mutton and, when meat was off the menu, they resorted to vegetables, but even then, the ‘white meats’ (dairy) were preferred. Focused on the Willoughby family of Wollaton Hall in Nottinghamshire and Middleton Hall in Warwickshire, this volume is founded on a long series of household accounts from the family archive in Nottingham University Library. Although there are many more accounts for the sixteenth century than for the medieval period, groups are unusual, and sequences of domestic records have much to tell us about household life and consumption. This Dawson does, making illuminating comparisons with midlands gentry and Aristocratic establishments, and useful connections to the works of William Harrison, Gervase Markham, and their like, on domestic and agricultural economy. The Willoughbys of this volume are principally Henry (1451–1528), with a rental income, supplemented by coal-mining and the sale of agricultural produce from demesne farms, possibly reaching £800 per annum; his son John (1481–1548); John’s nephew, Henry, killed in August 1549 fighting Kett’s rebels, leaving his children orphaned before they were of age; and Henry’s second son, Francis (1546–96), who married the daughter of a Warwickshire gentleman in 1564. Francis may have had an income exceeding £1,000, but spent considerably more: by 1589 his debts were estimated at £12,000–the 1580s saw the provision of dowries for three of his six daughters and Robert Smythson’s rebuilding of Wollaton Hall. A substantial part of the book analyses the accounts by commodity. The range of corns in use–drawn from demesnes farmed directly–shows long-term continuities, with common household bread of maslin in 1547–8 in use alongside a smaller quantity of finer wheaten bread. In 1588 bread production was 20 per cent higher than in 1547–8; but in that year 40 per cent was baked from wheat, against 17 per cent in 1588. Perhaps here we have the consequences of rising corn prices, with the economies falling on the servants. In terms of brewing, in the 1520s small quantities of ale were purchased from local women; later brewing was carried out in the household, and the author discusses the beers and their strengths. Meat consumption centred on beef, mutton, and pork, in order of quantity, with the first two drawn largely from demesnes. Distinctions relating to game and wild birds made on a quasi-sumptuary basis in late medieval England do not appear to have survived into the sixteenth century: Harrison’s criticism of wild-fowlers, diminishing resources for the general populace, betrays a similar change in attitude. Like medieval landlords, the Willoughby family were not poultry keepers, purchasing most of what they needed from peasantry, or receiving gifts of finer birds, especially capons. We find a handful of turkeys in the accounts from the 1570s. Cheese presses and related equipment underpin the evidence for domestic dairy production. If the consumption of fish had been motivated by religious precepts for avoiding carnality, it is instructive to see the effects of the Reformation on diet. Mid-Tudor legislation aimed at supporting the fishing industry, but its impact was muted. Household food budgets had devoted as much as 30–40 per cent of their charges to fish at the start of the fifteenth century: this had halved by the end of the century; and the Willoughby family at Middleton in 1547–8 devoted no more than 8 per cent to fish. Lent no longer demanded abstinence from dairy food and eggs. There is useful evidence for fruit and vegetables in the upper-class diet, and they may have had a special connection to the women of the household. Whereas her husband received gifts of game, it was garden produce that was brought to Elizabeth Willoughby. Fruits and verjuice appear in quantity, mirroring specialisms of English cookery. Changes in elite dining and expectations can be found in increased amounts of sugar in the diet, some employed for fruit conserves, and the disappearance of some spices, such as saffron (not in the accounts after the 1520s). New patterns are also reflected in the layout of Smythson’s Wollaton Hall, employment (customary wytes were paid to the cooks at Easter in the 1520s, but not later), tableware, napery, cutlery, and the pattern of meals. References to material culture, from skuttles for carrying bread, to mats for fish storage, are among the strengths of this book. They remind us that there is a great deal in accounts beyond the enumeration of commodities that can help us to understand the place of food in the household. The author also ranges widely over related topics, from feasts to food alms and waste. The volume is attractively presented, with some fine drawings by Peter Brears as well as useful illustrations. It is less strong on longer-term contrasts and the reasons for them. While much in it complements Joan Thirsk’s Food in early modern England (2007), this work, from a scholar early in his career, promises further perceptive contributions to the history of food.